To help avoid personal injury during a collision or sudden maneuver, exercise care when storing objects in the vehicle. Put luggage or cargo in the cargo compartment if possible. Do not pile luggage or cargo higher than the seat backrests. ► To open: pull handle 1 and open glove box flap 2. ► To close: fold glove box flap 2 upwards until it engages. 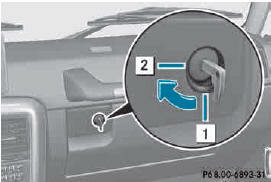 ► To lock: insert the mechanical key into the lock and turn it 90° clockwise to position 2. ► To unlock: insert the mechanical key into the lock and turn it 90° counter-clockwise to position 1. 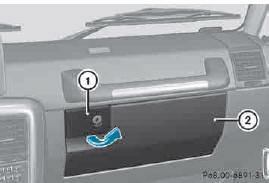 The glove box can only be locked and unlocked using the mechanical key. 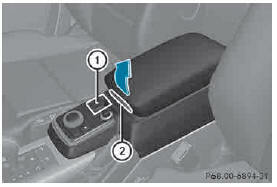 Stowage compartment/telephone compartment under the armrest X To open: press button 2. In the stowage compartment, there is a stowage tray. ► To close: fold the armrest down. Storage bags are intended for storing lightweight items only. Heavy objects, objects with sharp edges or fragile objects may not be transported in the storage bag. In an accident, during hard braking, or sudden maneuvers, they could be thrown around inside the vehicle and cause injury to vehicle occupants. Storage bags cannot protect transported goods in the event of an accident. The stowage pockets are located on the rear side of the front seats.